I reviewed The Martian this past August, and it was a fantastic book. It was the first novel for author Andy Weir, and rumor has it that the movie rights were sold within a week of the book hitting stores. 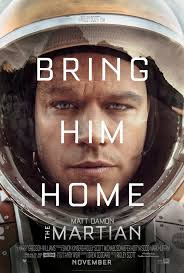 I was very excited, then, to see that the movie version was coming out this October, with Matt Damon as the title character, and I am glad to report that the film is just as good as the book. Mark Watney (Damon) and his crew have been inhabiting Mars for about two weeks when a major storm hits. The astronauts perform an emergency evacuation, and Watney gets hit in the head with a piece of debris; his crewmates think he's dead and leave him behind. It turns out, however, that Watney is in fact not dead, but he might as well be: he has enough food for a few months, but it will be years before the next Mars probe can land and provide him with more. Watney decides to "science the sh-- out of this," and with his botanist background, he starts growing potatoes from the existing ones he has. Meanwhile, NASA has just figured out that he survived, and is frantically trying to figure out a plan to get him safely back to Earth. If you look on the IMDb page for this film, it reads like a Who's Who in Hollywood in 2015. The cast includes the NASA astronauts - Damon, as well as Kate Mara, Jessica Chastain, Sebastian Stan, Michael Peña; the NASA higher-ups (Jeff Daniels, Sean Bean, Kristen Wiig, Chiwetel Ejiofor; and some supporting roles, like Sam Spruell, Mackenzie Davis, and Donald Glover. Needless to say, the acting is fantastic in this film, especially Damon, who is a one-man show until NASA wises up and gets involved (and therefore splitting screen time with him, as well). Yes, definitely see this film. I had no idea it was in 3D until I arrived at the screening, and the 3D was great as well; if you can see it in 3D, I highly recommend it. The film will inevitably draw comparisons to Interstellar - Chastain is even in both movies - but The Martian is more of something that could happen in real life, in my opinion, and Interstellar was definitely more of a sci-fi film. I don't think they modified much from the book, except the ending is a little different (more like the post-script than the actual ending), but it's a change I approved of. This movie should do great in the theaters based on its cast and the book's fan base, and it's well-deserving of any accolades that it receives. The Martian is in theaters today, October 2nd, and is rated PG-13 with a runtime of 141 minutes. 4 stars out of 5.